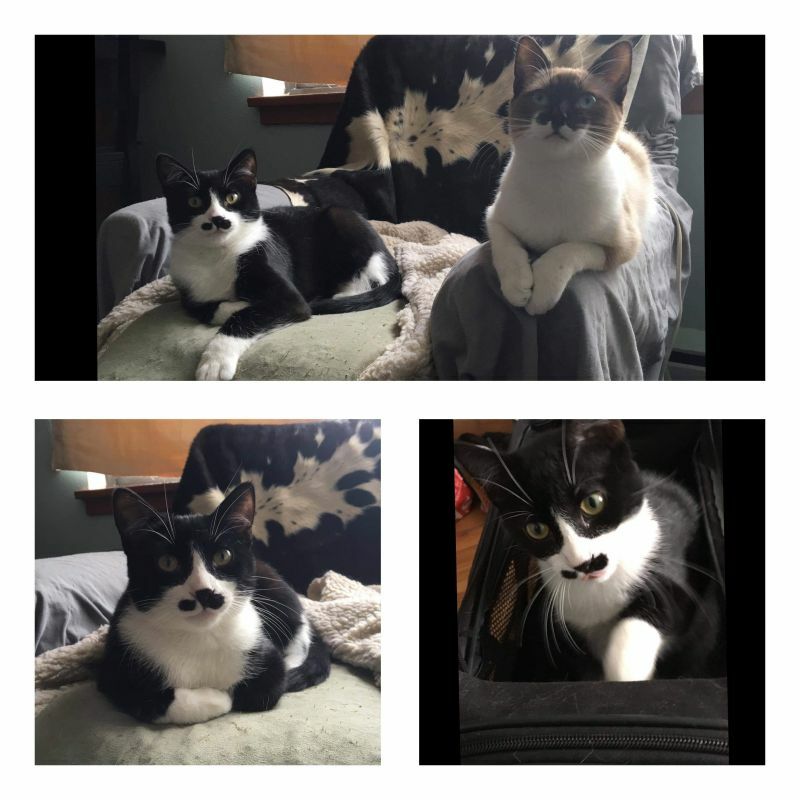 The Mustache Twins, Frodo and sister Arya were found abandoned at a dog park last fall. This dynamic duo is bonded and they would like to remain together. Frodo is a neutered juvenile tuxedo cat, his coat is smooth like satin and he always appears dressed for a night out in his tux! He enjoys a bond with humans, his sister and his foster dog brother. He enjoys close cuddles and affectionately âworriesâ when the humans use the bath tub. He is the first to alert the human of breakfast is late, but always with a polite paw and meow. Arya is a spayed juvenile cat, possibly a mix with Siamese. She has striking blue eyes and a very gentle nature, along with her white âbeard and handlebar mustacheâ, she is a looker. She is light on her feet and incredibly sweet. She enjoys baths from her dog foster brother, a Irish Wolfhound, playing with her brother, Frodo and cuddles with humans. 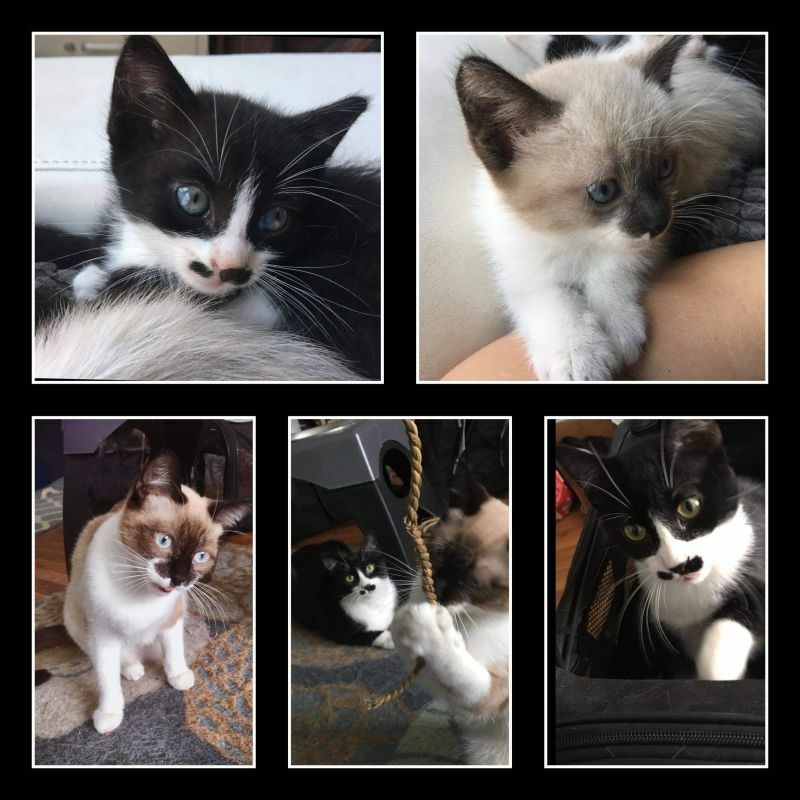 All cats are feline leukemia and FIV tested, spayed or neutered, vaccinated, de-wormed and treated medically as needed and housed at the shop until suitable homes arise. Dogs are primarily housed in foster care and appointments can be set up to meet adoptable dogs. Small animals like rabbits, hamsters, gerbils, birds and many other kinds of fuzzy friends are housed at Windmill Animal shelter and can be visited, and adopted, during normal business hours.